How electric is Volvo's future? Can China's electric cars kill off petrol? 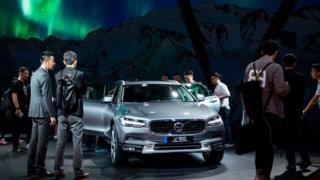 "This announcement marks the end of the solely combustion engine-powered car," said Hakan Samuelsson, chief executive of Volvo's carmaking division. "People increasingly demand electrified cars, and we want to respond to our customers' current and future needs," he said. Volvo's announcement sounds dramatic, but the reality is it simply reflects the direction much of the auto industry is travelling in. The internal combustion engine is not dead - and won't be for a while at least. It still offers a relatively cheap and well-proven means of getting around. The problem is that emissions regulations are getting much tighter. From 2021, for example, carmakers in the EU will have to ensure that across their fleets, average CO2 output is no higher than 95g of CO2 per kilometre. That's a lot lower than current levels. Carmakers are reacting by developing fully-electric models. Some are already pretty impressive. But developing mass market cars that are affordable and have the right levels of performance is a research-intensive and expensive process, while persuading consumers to buy them in large numbers may also be time consuming. In the meantime, hybridisation - fitting electric motors to cars which also have conventional engines - offers a convenient way to bring down emissions without harming performance. And there are plenty of different kinds of hybrid systems to choose from. Tim Urquhart, principal analyst at IHS Automotive, said the move was a "clever sort of PR coup - it is a headline grabber". "The announcement is significant, and quite impressive, but only in a small way." It comes after US-based electric car firm Tesla announced on Sunday that it will start deliveries of its first mass-market car, the Model 3, at the end of the month. Elon Musk, Tesla's founder, said the company was on track to make 20,000 Model 3 cars a month by December. His company's rise has upset the traditional power balance of the US car industry. Tesla, which makes no profits, now has a stock market value of $58bn, nearly one-quarter higher than that of Ford, one of the Detroit giants that has dominated the automotive scene for more than a century.